ring too tight or too loose? Don’t worry. EverettBrookes will resize any ring you buy from us, FREE, in the first 90 days. This gives you time to go through a change of seasons to determine the optimum size for you. There is no perfect size as everyone changes over the year. Rings are tight in warm weather, loose in cool weather. We simply need to find the best size that suits you. The best way to determine your finger size is to have one of our experienced staff measure you in-store. 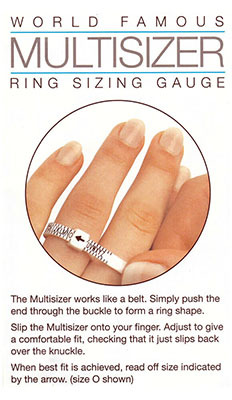 If that’s not possible then we’ll happily send you a FREE Ring Sizing Gauge.